Although the instruction is individualized and mainly self-paced, students will be expected to maintain the following semester schedules as closely as possible. Completion of one (1) violin body. Demonstrate preparation and maintenance of hand tools. Maintain a daily log of work achieved. Begin required reading of history of classical makers. Begin or advance musical training – outside of school on private basis. Completion of two (2) more violin bodies to reinforce lessons from the first semester. Demonstrate ability to work towards higher standards of quality, speed, and with less supervision. Maintain notebook and daily log. Carve three (3) scrolls and set the necks on the three violin bodies. Study, formulate, and apply a spirit-based varnish. Complete the varnishing of the first three (3) violins if not already completed. Complete the set-up of three (3) violins. Complete one (1) viola ready for varnishing (in-the-white). Maintain and continue notebook, daily log, technical drawing, reading, and musical training. Study, formulate, and apply a cooked oil/resin varnish. Complete the varnishing and set-up of the viola. Complete one Complete one (1) additional instrument from an option of a violin, viola, or cello ready for varnishing (in-the-white). Complete previous instruments as neccessary. Complete one (1) additional instrument from an option of a violin, viola, or cello ready for varnishing (in-the-white). Students must have completed all requirements before going on to the examination period. If previous work has been completed prior to this semester, students may elect to concentrate on technical repairs. 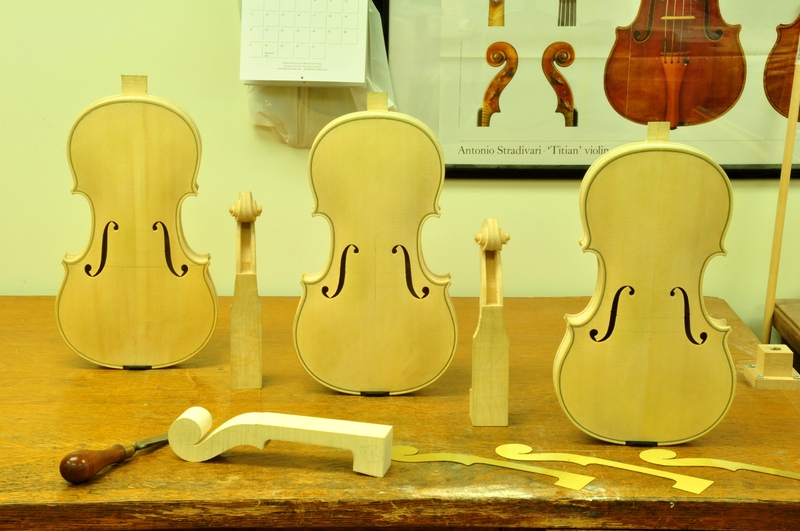 Build one violin or viola in-the-white with complete set-up to demonstrate construction skills and abilities. Draw one technical drawing of the same instrument. Varnish and set-up a previously made instrument to demonstrate varnishing ability. Complete a brief repair test. Pass a written and oral theory test. Demonstrate successful advancement of musical ability and perform on a violin family instrument at the graduation ceremony. Students who fail the graduation exam may, at the instructor’s discretion, enroll for another semester and complete such works as to be prepared to attempt another graduation exam. A student will receive a diploma certifying successful completion of the program upon completion of the exam and payment of all fees.